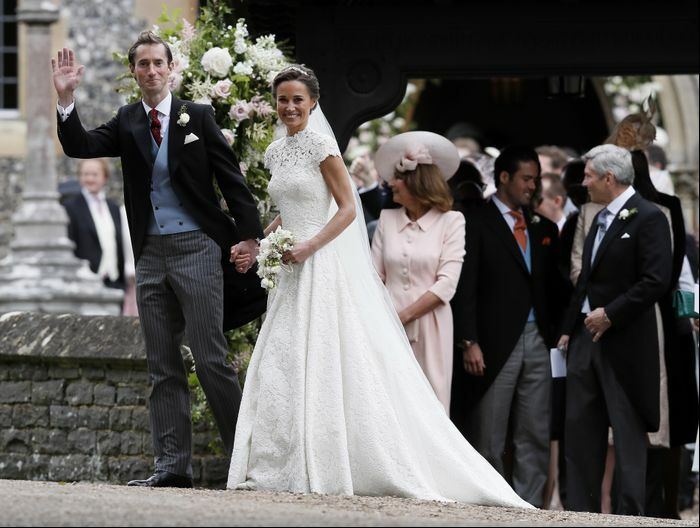 Update: Congrats are in order for the lovely bride and groom, Pippa Middleton and James Matthews. And, after much anticipation, we can finally confirm the one detail we were all were curious to learn about: the dress. For the momentous affair, Pippa went a classic and romantic route in a custom Giles Deacon gown that features a slight mock neckline and cap sleeves. The all-over lace design was accented by a small tiara headband and elegant drop stud earrings. See the bride and groom for the first time below. The date is set: Pippa Middleton will marry James Matthews on Saturday, May 20. We've already given you the rundown of everything we know about the wedding, including the location and the royal children's roles, so all there's left to do is speculate about that all-important fashion detail: her wedding dress. Which brand will she choose to wear on the big day? Thanks to paparazzi photos of Giles Deacon at Middleton's home, the designer is certainly a strong possibility. But we're not ruling out other British designers just yet: There are so many other UK-based brands that also create dreamy, wedding-worthy designs, including Temperley London and Erdem. Below, we've rounded up some of our favourites while we countdown to the big day. Scroll down to see our wedding dress ideas from three British brands. Next up, see the best celebrity wedding dresses of all time.